Air Inlet Filters for Gas Turbines | Air Filters, Inc.
Air Filters Incorporated™ gas turbine air filters are used on large engine air intake filters specially designed for gas turbine systems and other turbo machinery equipment such as compressors or diesel engines. 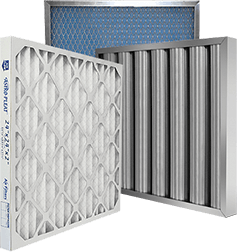 These air inlet filters are built to protect the gas turbines against the environmental elements and air pollution. A combination of filters can be used together in order to provide the best operating conditions for your equipment. These multiple stages can protect against moisture, vibration and pressure surges which could increase performance and reduce emissions. Turbo machinery filters (air filters for gas turbines) come in many different configurations which may be needed depending on the environmental conditions or the setup of your air inlet system.